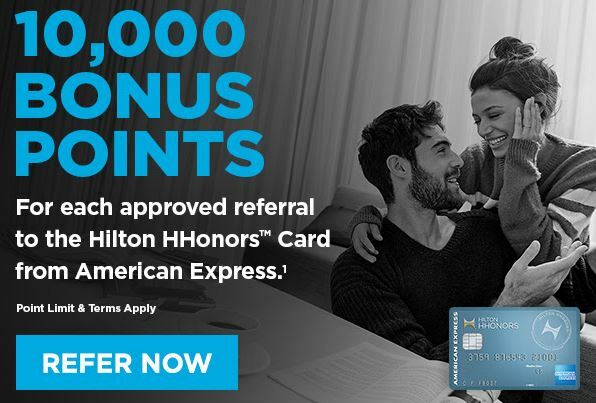 I’m not here to entice you about the the “amazing offer” on the American Express Hilton HHonors card which is currently at an all-time high of 75,000 Hilton HHonors Points – fellow bloggers with affiliate links have done well doing that. Instead, I got an email from Hilton yesterday letting me know current cardholders can refer others for the same 75,000 point offer and earn 10,000 points for themselves. 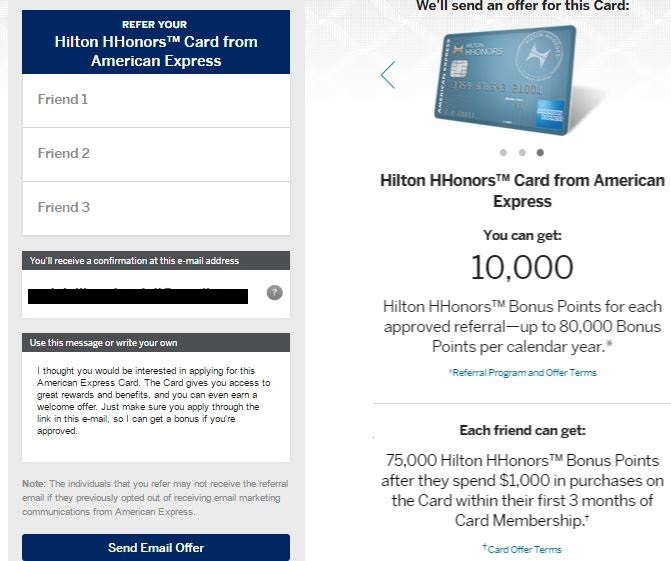 I knew you could refer others for the American Express Hilton HHonors Surpass card for 10,000 points but the refer a friend offer is available for this no annual fee card as well. To refer someone, visit this link for American Express’s refer a friend site. From there enter your card information or your American Express log in and you should see the offer to refer others that will look like the below. If anyone would like a referral, please shoot me an email at ralph@pointscentric.com or let me know in the comments (don’t worry only I can see your email address). I’ll also allow readers to leave their referral information if they so choose in the comments. With American Express’s once a lifetime policy for signup bonuses, you should only apply for Amex cards at their peak signup bonuses. This card qualifies but make sure the Hilton card is a good fit for your travels. I have the referral link for the American Express Hilton Honors card!! Spend only $1,000 in 3 months and receive an amazing 75,000 bonus points!! Here is my referral link for 75K. You can earn 75K Hilton Honors point after spending $1,000 in 3 months (no annual fee) using http://refer.amex.us/SRISHJLhXO?xl=cp01-117 until July 26th. Thank you for using my referral link.